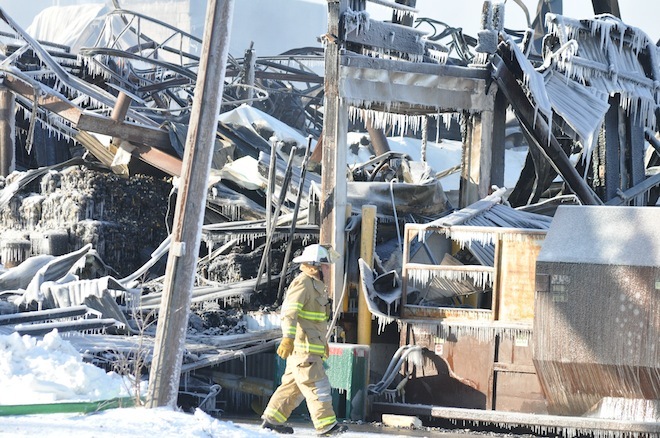 Left in the wake of a more than 15-hour battle against an eight-alarm fire at Echo Lake Foods Thursday was an eerie scene of devastation – blackened metal support beams heavily hung with icicles. These were stark reminders of the destructive fire – both in terms of property and economic impact – and the nasty conditions under which it was fought. 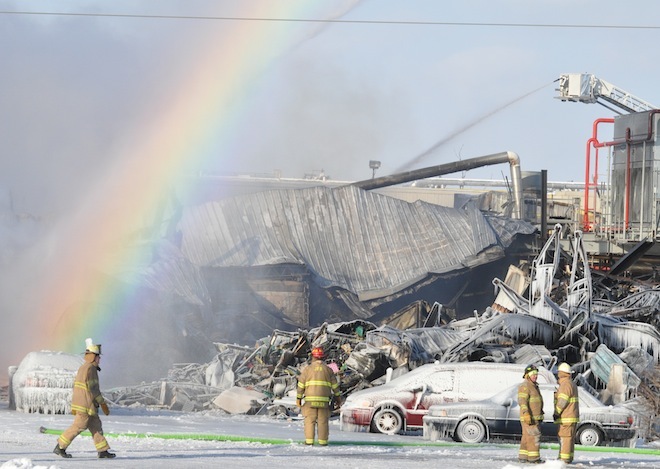 However, as a bright sun rose over Burlington Thursday, rainbows – projected by the prism of the firefighters’ spray – arced over the scene creating at least a small sense of hope that the food processing company, which employs 300 people, and the community would make a quick recovery. 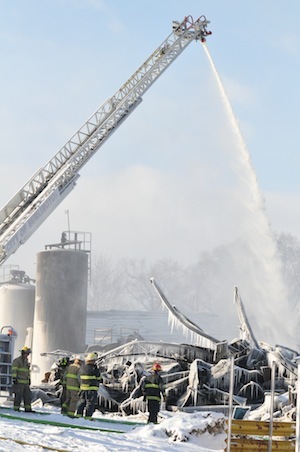 Although flames and smoke were no longer visible as of 9 a.m., fire crews continued to deluge the charred and twisted remains of the metal buildings as they searched for stubborn hot spots at the breakfast food processing plant just off Honey Lake Road. Mayor Bob Miller said earlier Thursday that the fire was still active and predicted cleanup efforts would take the better part of the day once it was fully extinguished. As difficult as the fire – dubbed the worst in recent memory and perhaps the worst in the city’s history by Miller – was, now company and government officials must begin the even more arduous task of rebuilding a family-owned company that has been around since 1941 and was among the city’s largest employers. But judging by the community’s response to the blaze, that task, too, can be dispatched with orderly precision carried out by well-trained, caring professionals. Amazing photos of this tragic event from start to finish, on top of the great and in-depth news coverage. Wholly impressive and so important at such a devastating time in this close-knit community. Thank you for keeping the community well informed. The consistent communication calms nerves and you all provided an excellent source of information. My thoughts and prayers to the families affected by this tragedy. Pride, so much pride for all those brave firefighters willing to risk their lives for other. Thank you. Chrystal said it best….so much pride for all the firefighters, near and far, that risked their lives. Please remember they are volunteers. Remember that when the fireman’s picnic is in the summer, when they have their benefit dinners, when they place notes in your newspaper box selling raffle tickets. Such a tragedy for the employees but if we, as neighbors, can come together like those hundreds of firemen and firewomen, we will be a better community. Ed, thank you for your positive perspective on a tragic event. We are praying for the employees and their families. I am praying for those whose jobs have been lost. I know that with time and prayer everything will work out.